Catholic Underground ©, a.k.a. 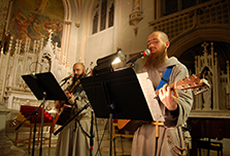 CU, is a cultural apostolate of the Franciscan Friars of the Renewal - www.franciscanfriars.com. It is a direct response to a call that began with Pope John Paul II, and is continued by Pope Benedict XVI. JPII said that because the Gospel lives in conversation with culture, we must be fearless in crossing the cultural threshold of the communication and information revolution now taking place. The first part of the evening is Eucharistic adoration, and begins with Vespers (Evening Prayer). This is the universal prayer of the Church - prayed by the Catholics throughout the world in every time zone and in every language. After Vespers, there is a time of simple praise. This provides a window for each person to personally encounter Jesus Christ. 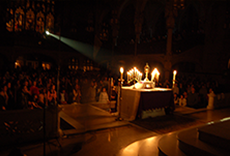 The beauty of the darkened Church illumined by candles helps us enter the mystery of our Lord's presence in the Eucharist. The holy hour ends with solemn Benediction. The second part showcases Catholic artists. Here we experience the “new evangelization”. The Underground includes music, poetry, visual art, dancers, film, drama, etc. We end our evening as we began. With the prayer of the Church. Compline (Night Prayer) is simple and beautiful. It concludes with a hymn to Our Lady, Daughter Zion. Mother of the New Jerusalem. 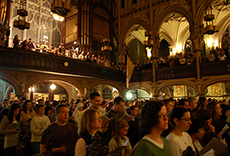 Catholic Underground NYC music is available on iTunes (click here).